Mary Wilkes, age 9, donated one-half of her craftwork proceeds from the FUMC Holiday Bazaar to Starkville Habitat for Humanity. Mary’s smile shares her joy of knowing all her donated dollars will go into the building of a Habitat home for a needy Starkville family. (Pictured: Mary Wilkes, center; Joel Downey, Executive Director, Starkville Habitat for Humanity- right; Lindsay Wilkes, Mother, far left). 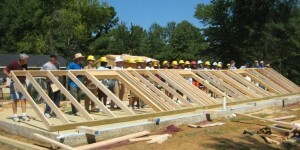 The Starkville Area Habitat for Humanity is a Christian mission that seeks to put God’s love into action by building homes, communities and hope. The Starkville Area Habitat for Humanity is dedicated to eliminating substandard housing through the construction of new homes and providing an affordable mortgage to low income homeowners who need a better place to live and are willing to work hard to make a better life for their families. Habitat for Humanity was founded on the conviction that every man, woman and child should have a simple, durable place to live in dignity and safety, and that decent shelter in decent communities should be a matter of conscience and action for all. All are … Read More..